Microsoft Project® can be the most frustrating software you use if you don’t know how to unlock its secrets. Every good craftsman relies on good tools. Learn the most popular tool of project management, Microsoft Project®. In this course you will learn how to use Microsoft Project® to help you plan and manage your projects. The mantra for this course is “If it is easy, it is wrong!”. Learn the proper way to use Microsoft Project and reap the benefits in better planning and execution of your projects. This course can be taught in either a 2 day, 14 PDU format or a 3 day, 21 PDU format. The additional day allows for more, in depth explanations and more time for course exercises. At the beginning of Day 3, you will have the opportunity use what they learn on a project of your choice. 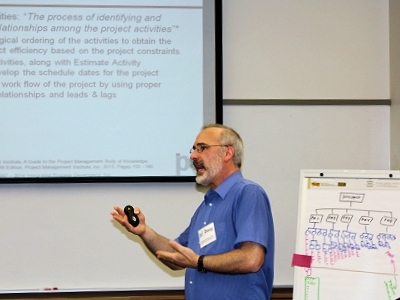 This allows you to ask questions to the instructor for insight into specific situations on your project. See our Public Course Schedule for a course near you.